When I was a wee boy, we used to go down to Rascarrel shore fairly regularly, and I used to play pooh-sticks in the burn from the wee footbridge. It wasn't, as a boy, my favourite beach, being stony and windswept, but it was under a mile and a half from our house up at Nether Hazelfield, and the old medieval road from Rascarrel shore up to Rerrick, although by then abandoned, ran by the end of our lane and was still recognised by the farmers as a public right of way. By the time I was ten, I was permitted to walk down to Rascarrel on my own. Rascarrel was not a pristine shore. It was part of a populated landscape. It had been occupied by the barytes miners, by miners for coal and copper, by fisherfolk and by smugglers over the historical period. John Thomson's map of 1832 shows a coal mine and a smithy on the shore. There are dwelling sites all along the bay. The beach itself is rocky, and strewn with large, rounded pebbles; there's nowhere that's sandy, nowhere to launch a boat, and few places where it was easy for a child to get into the water to swim. Consequently, as a child, I preferred Balcary for sailing and Red Haven for swimming. But Rascarrel was our nearest beach, and the only one I could get to by myself, so I went there often. There is a natural rock arch which I've loved all my life and have many photographs of, and several minor caves. There had been a little barytes mine at the end of Rascarrel shore; it must have been a small works, no more than a couple of men and a boy in all likelihood, because the ruin of the miner's cottage is a wee place. The mine was last worked in my lifetime, but I don't recall ever seeing that cottage with a roof on. What I do recall, however, was three separate groups of cheerful, well maintained summer huts, owned by people mainly from Dumfries. There was one group of two or three huts by the miner's cottage; a group of six or seven just to the east of the burn, where the old medieval road comes to the shore; and another group of three or four about a hundred metres west of the burn, accessed over that footbridge. They had been there since the 1930s, and were a well established part of the landscape. In the early seventies, the footbridge washed away in a spate and was replaced by a new, higher bridge, I'm pretty sure at the council's expense. As is appropriate; it was a public good on a public right of way. In summer, Eddy Parker used to keep his boat moored in the burn mouth; an exposed place, but it was a tough old boat and Eddy knew what he was up to. I would sometimes anchor my boat off there in the summer. We would go down in autumn and winter to collect mussels off the rocks, or pick up driftwood along the strand. As Margaret Thatcher's recession closed in in the 1980s, the poorer folk of the village went down onto the shore at Rascarrel to collect mussels which they sold to the shellfish factory in Kirkcudbright - hard work for little money - and the larger mussels soon vanished in consequence. About this time, too, the council constructed an improved car-park at the shore end of the lane, at public expense. 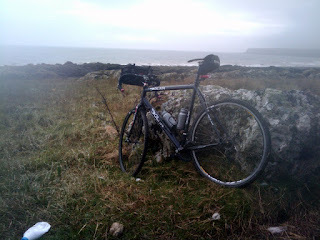 During the 1990s I used regularly to ride a mountain bike on the loop round Rascarrel shore, and back by Balcary Heughs. The place has always been part of my life. All this time the hutters came and went, and maintained their little cabins well. I didn't know any of them, but I would greet them in passing, as you do. There was no hostility between village folk and the hutters. In the early eighties one of the huts was lived in by a friend of my sister's, Bill, and we used to walk my niece Zoe who was then about one down to the beach in her wheelchair, and have a mug of tea in Bill's hut while he yarned or played guitar. Rascarrel farm was then owned by a family called Hendry, who had a daughter a bit younger than me. She married one of the MacTaggart lads, and together they inherited the farm. The hutters continued to quietly enjoy their huts, but there were complaints about increases in rent demanded by MacTaggart, and some of the huts fell into disrepair. In 2004, the MacTaggarts decided to evict the hutters and build their own holiday chalet development on the site. There was a long legal fight, but in 2007 it was lost and the hutters were evicted. The MacTaggarts then applied for planning permission, which was fiercely resisted by Auchencairn Community Council. However, after two applications were turned down by Dumfries and Galloway council, a third application was appealed to the Scottish Government, who overruled local objections and approved the scheme. Just encountered farmer objecting to me parking 2 walk 2 ruined huts at Rascarrel 4 PhD. Says my car cd be scrapped by passing lorry! During the course of the year, 'old' Mr MacTaggart has died; but his son continues the same aggressive policy. On the Roy Military Survey of Scotland, 1747-1755, the lands of Rascarrel are not enclosed. It was then common land. It's not marked as enclosed land on subsequent surveys either, but then they typically don't mark enclosures whereas Roy's map did, so they aren't evidence. Still I should be interested to know when, and under what legal theory, the right of common was extinguished? On the shore road out of Auchencairn towards Balcary, reed-beds are naturally reclaiming the bay. There's an area that was open mud when I was a boy, and then reed-bed, and then, as land was established, rough grass; and now the householder across the road has put fences round it and claimed it as his own - again, on what legal theory I don't know. There is an assumption these days that land must belong to someone, that anything as dangerous and subversive as unowned land must be extinguished as quickly as possible. When Rascarrel was 'just a farm', rented from Auchencairn estate, did the rented area extend to the tideline? When the estate was parcelled up and sold off, were the lands to the tideline sold with it? I'm guessing so, or someone would have protested before now. But, more significantly, what claim apart from arrogance and fiat did Auchencairn estate have to the shore? Whatever the legal theory, what has happened on Rascarrel shore in the past decade amounts to enclosure of common, since this was land freely enjoyed by the people of Auchencairn and the surrounding area for leisure, for recreation, for fishing for generations. It amounts also to the extinguishing of our rights under the Land Reform Act. It also undermines the rights of all hutters, everywhere in Scotland. If we aren't prepared prepared to defend those rights, we will lose them.